Tourism in Cambodia is a rapidly growing industry. 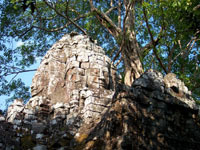 With Ankor Wat being the main attraction,if people remain in Cambodia after visiting the temples they tend to visit Phnom Penh the capital city and the beaches of Sihanoukville. Compared to Thailand the country is relatively untouched by tourism. Especially in the coastal area there are some jewels to find. 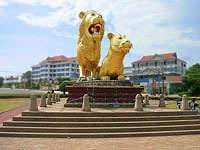 Sihanoukville is Cambodia's premier beach town. Its white sandy beaches and warm Gulf of Thailand waters combine with a laid back, beachy atmosphere to provide a great little tropical getaway. Sihanoukville is a place to unwind by the beach, enjoy the fresh from-the-ocean seafood, take in a snorkeling or diving trip, and generally slow-down, lay back and chill-out. For the people looking for a more upbeat holiday, there are also many late night bars and clubs to party into the early hours of the morning. Koh Rong Samleum is the neighbor island of Koh Rong. 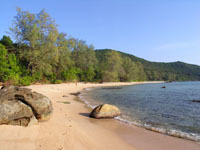 The island is even less frequented by tourism than Koh Rong. Its the perfect spot to make a break, relax and spend the days sunbathing on our private beach. Getting there takes roughly one hour by boat from Koh Rong. Our private beach offers the most beautiful sunset ever seen in Cambodia. 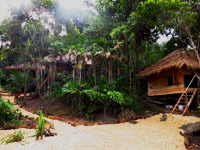 Its also a very interesting spot for larger groups or honeymooners, why not rent the whole resort and beach? The Happa Garden Resort is an ideal choice for an unforgettable, once-in-a-lifetime romantic getaway, located at the Sunset Beach on the quiet western side of Koh Rong Sanloem Island. We aimed to combine natural material with a modern style to be able to offer our guests a higher standard whilst staying with us at the Sunset Beach. In their dedication to making your stay a happy one, the Happa Garden Resort team has created a personal space that you will never wish to leave. All rooms are unique with different decorative details and colour schemes, making each visit a brand new experience. The impeccable details and quality furnishings are just a few of the special features in each of the well-appointed rooms. Our resort on the the paradise island Koh Rong Samleum offers private bungalows with large beds, mosquito nets, western toilets, showers and an idyllic view from your own private veranda. 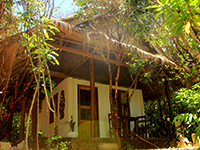 The Robinson Bungalow Resort is the only resort built on the sunset beach at the north west of the island. The island is frequented by people of all ages, mostly to escape the touristy beaches in Sihanoukville. The restaurants quisine ranges from local Khmer delicacies, including luk lak and amok curry, to western style dishes such as schnitzel, burgers, fish and chips.